Last summer, Hurricane Harvey slammed Houston, damaging more than 204,000 homes. Weeks later, Hurricane Irma struck damaging about 65 percent of homes in the Florida Keys. Then Hurricane Maria devastated Puerto Rico, leading some 1.1 million homes to report damages. And those were just the worst hit locales. All told, last year’s big storms likely caused billions of dollars of damage to millions of homes. Data on this year’s storms are still coming in. But in one North Carolina neighborhood, Hurricane Florence destroyed all but two homes. These losses may not be as widely felt as the infrastructure damages that paralyze cities, or as harrowing as these storms’ death tolls. But home damages have a devastating and enduring impact on homeowners and renters alike. A year after Hurricane Harvey hit, about 10 percent of Texans who lost their homes or apartments to the storms were still displaced. This is likely just the beginning for homeowners in the American southeast, the nation’s key hurricane risk zone. As climate change continues to warm the Atlantic, hurricanes will likely become larger and last longer when they strike. While there isn’t much the average person can do to keep storms at bay, developers, builders, and individuals living in hurricane risk areas can still take steps to guard against the emotional and economic hits of property damage by building, or retrofitting, more resilient homes. Doing so doesn’t require some new, cutting-edge material or turning houses into fortresses; in fact, most storm-resistant building relies on well-known construction methods that have been available for decades. “Architects already have knowledge of resilient materials and construction techniques capable of withstanding most hurricanes,” says Rose Grant, chair of the American Institute of Architects’ Disaster Assistance Committee. The big question is, then: why do builders and homeowners not already use these protective tools and techniques? From the foundation, developers can mitigate the dangers of high-speed winds through clever home designs. 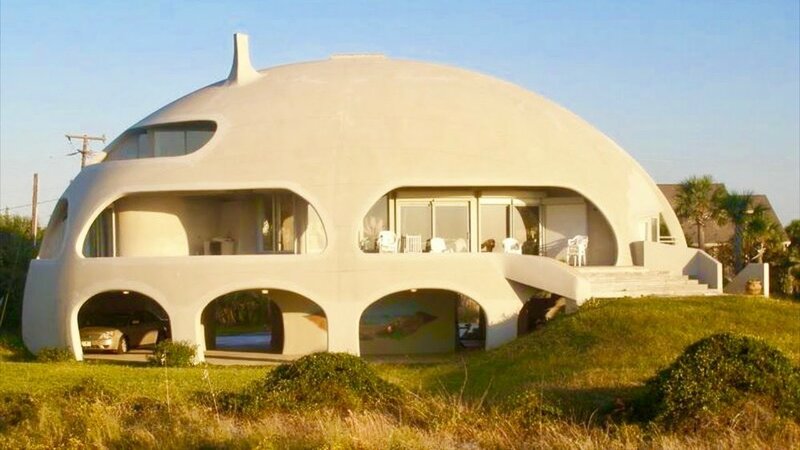 Round homes, for example, prevent wind from building up on any one point. It is hard to say exactly how wind power much rounded shapes alone can defray, but Deltec, a home building firm founded in 1955, believes its designs can withstand a category five hurricane, boasting that none of its famous round homes sustained major damage in storms like Hurricanes Andrew and Katrina. Other rounded home makers claim their structures can withstand winds up to 150 miles per hour. Perfect square designs can also afford a greater level of structural strength than other common home shapes. For traditional building styles, concrete foundations and walls allow the structure to withstand much more punishment than wood alone. Simple added features like off-the-shelf impact glass, doors, and shingles, as well as special ridges and vents to dissipate air, can increase high wind resilience. Securely strapping roofs, anchoring them firmly to the structure’s foundation (and generally making sure roof-building is done with a responsible amount of attention to detail), can also go a surprisingly long way toward preventing worst-case scenarios. The other huge concern for homes in a hurricane zone: flooding. “Hurricanes like Sandy and Harvey,” Gregory points out, “were just big rain events,” rather than major wind concerns. Rainfall will likely become an increasingly predominate risk, Gregory explains, as climate change may not affect the winds of most hurricanes (it is hard to say for sure), but it will almost certainly increase their water loads. This will cause increased flooding, especially across landscapes that used to soak up flood waters but were developed and paved over as coastal cities expanded, like Houston’s rapidly vanishing floodplains, These floodwaters can fry vital utilities in their path, and seep into building materials like wood, slowly rotting them long after a storm passes. In either initial construction or a retrofit, deciding what is needed and calculating the cost is difficult. Regional landscape differences, notes Grant, all lead to different types of risk for builders and homeowners to consider: What level of flooding can one area expect over another in the same storm due to elevation and natural runoff mechanisms? Will the landscape channel and magnify wind? Does one live close to trees that might fall over in a severe gust? Even the way a neighborhood is designed, says Gregory, can change building calculations. The orientation of buildings—“city texture,” as he calls it—can exacerbate hurricane winds. Yet while some materials, like high-performance concrete or super storm-resistant shingles, can be twice as expensive as less resilient products, most home building techniques are relatively inexpensive. Working with concrete, for example, can cost about 15 percent more than using a wood frame. Even mild costs may still seem daunting, especially to homeowners with limited resources, but resilience often comes with long-term cost benefits. Gregory points out that a tightly built home, for example, may require less energy to maintain. Similarly, a durable roof may cost more upfront, but it will require fewer repairs and last longer than cheaper alternatives. And while resiliently built homes can still take some dings and dents in a storm, Gregory’s research on homes in Charleston and New Orleans shows that homes incorporating structural protections will generally require far fewer repairs in the event of a disaster. Weighed against the costs of repairing repeated storm-related damages, argues Gregory, “you can get paybacks” on mitigation efforts “within three, five, or seven-year time ranges” in many cases. But though these solutions are readily available and usually cost effective over time, few developers or builders seem to use them. According to the Insurance Institute for Business and Home Safety, since 2008, only 8,126 new homes in the United States have received official “Fortified” certifications, guaranteeing their readiness for a disaster like a hurricane. Meanwhile, people continue to develop land in ways that reduce natural storm resistance. So why aren’t more homes built to stand up to storms? Much of our failure to fortify homes against hurricanes, explains Gregory, boils down to the fact that “human beings are poor at evaluating risk and acting on it. It is easy for us to tell ourselves, ‘that’s not going to happen to me,’ or, ‘there’s nothing I can do about it,’” especially with events as unpredictable as hurricanes. As a result, Gregory says, developers and builders face little pressure to prioritize hurricane risk mitigation, even in high-risk zones. Developers accordingly may choose to trade off resilience for features, like extra square footage or stainless-steel appliances that they know consumers in an area will demand, and for which they can definitely charge a premium. Meanwhile, federal insurance programs pay people hit by disasters to rebuild their homes, rather than properly incentivizing storm-resistant rebuilding. Often, Gregory acknowledges, people look to building codes to solve this problem—especially in the wake of a hurricane. These regulations can force builders’ hands, both in terms of the materials they use, and how new developments must take terrain and weather-related concerns into consideration. Regulations have been effective in the past. After Hurricane Andrew destroyed over 100,000 Florida homes in 1992, new statewide building codes progressively beefed up the resiliency of new homes; structures in the Miami area now must be able to survive winds up to 146 miles per hour. These homes, Grant points out, have survived recent hurricanes fairly well. And some other states and municipalities facing similar levels of hurricane risk have followed Florida’s lead. But building codes and similar laws are also limited tools. Because many regulations only apply to new structures, Grant notes that even where new requirements are legislated, tons of old buildings remain vulnerable. Aside from regulation, “I’d prefer to see if we can create more market demand for hazard resistance,” says Gregory, which would push developers to meet higher standards on their own. This would likely also grease the wheels for future attempts to enact new pro-fortification laws and regulations. Figuring out how to create that demand is tricky, but as Grant points out, it really boils down to adequately communicating the long-term value of fortification, especially over cosmetic upgrades. Some metrics indicate that consumers are already increasingly interested in buying hurricane resistant homes, or retrofitting their existing homes with disaster preparedness in mind, when they have the resources to do so. The problem, though, is that many people lack those resources. Creating a label designating homes that meet hurricane fortification standards, muses Gregory, could boost consumer awareness of resiliency options and their desirability. That, in turn, could produce market interest that could tip developers and builders toward action—akin to how LEED certifications for energy-efficient homes have helped to raise market interest in green building over the past two decades. Grant and Gregory both point out that insurance and tax incentives for fortification could also help to push the dial, while low-interest loan programs for retrofitting old home to be more storm-resistant would help as well, says Grant. As with all social change, though, shifting market awareness of and demand for existing risk mitigation tools and techniques will likely be a slow process—as will be pushing for better resilience-minded building regulations. The severity of recent storms has helped to boost interest in existing materials and methods, though. So change might not be as far off as we think.